When talking about portable music devices, iPod Nano and iPod Touch can be two representatives among all music players. They are both popular music players from Apple Inc., even though they have similar name, they are quite different in terms of performance. With Apple refreshing its iPod product lineup every few years, buyers always have various options to choose when they purchase the devices for themselves. For those people who have hesitation in choosing a proper music player, a clear list of differences between iPod Touch and Nano is helpful for them to make the choice. If you haven’t used iPod Touch and iPod Nano, you couldn’t know the detailed differences between them. So in this tutorial, we are going to compare iPod Nano and iPod Touch, in order to help users fully understand the functions, performance and design differences. In the following part, we will introduce iPod Touch and iPod Nano, as well as list some differences between iPod Touch and iPod Nano. Well, iPod Nano or iPod Touch, which to buy? Generally, many people choose iPod Nano because its main function is playing music. Of course, as a music player, the first character is small; it should be easy to carry and doesn’t take up too much space. But when you are tired of its function of playing music and videos only, you can choose a multifunctional music player, which is iPod Touch. In addition to the ability to access the Internet and different capacities, iPod Touch can also change the way images displayed according to your hand-held style. You can install a large number of third-party softwares on iPod Touch, but iPod Nano is a just a player. What’s the difference between iPod Touch and iPod Nano? Some differences between iPod Touch and iPod Nano are intuitional. In a lot of people’s eyes, the most distinct difference between iPod Touch and Nano is their size. Of course, no matter which generation of iPod Nano, the size of it is always that small and thin. It is pocket-sized, so easy for us to carry. But iPod Touch is more like a phone’s size, it is bigger than iPod Nano. Of course it has a big screen for you to touch and control. The seventh and final generation iPod Nano was released in September, 2012. We can see that iPod Nano is always fashion in design, and many colors are available when you buy an iPod Nano. Relatively, iPod Touch has fewer choices on colors. Actually, iPod Nano is just a music player with a screen, it is simple and convenient. And it doesn’t run iOS, so you couldn’t install apps. But iPod Touch runs the same operating system as iPhone, so you can install many apps on it. Like we mentioned above, iPod Nano is relatively simple and easy to operate, it only allows you to listen to music and watch videos. But on iPod Touch, what you can do is not just as simple as playing games. In fact, iPod Touch is an iPhone that can’t call and send text messages. Since it has the same operating system as iPhone, the 100,000 applications supported by iPhone can also be used on iPod Touch. The capacity of iPod Nano ranges from 1 GB to 16 GB at the maximum level. But the latest iPod touch has a capacity of 128G. Of course they have different price. Since iPod Touch is like an iPhone without phone function, but it has powerful entertainment functions. However, iPod Nano is like an MP4. Thus, iPod Touch has high cost effectiveness. Above are some main differences between iPod Nano and iPod Touch. However, they have even more differences because of different product positioning. For most iPod Nano and Touch users, the most important thing is to back up the data in their devices. Undoubtedly, everyone wants to keep the data safe, especially some preferable songs in the devices. At this time, we can use iTunes to make a backup of music in iPod Nano and Touch. If you have purchased lots of files from the iTunes Store, you can transfer files from iPod Nano or Touch to Mac via iTunes. However, you can only transfer the files that you have already purchased. The steps are as follows. Step1. Launch iTunes and head to “Preferences”, click on the “Devices” button. In the next panel, check “Prevent iPods, iPhones, and iPads from syncing automatically”. Step2. Connect your iPod to your Mac and then go to the iTunes Store. Select “Authorize This Computer” and then sign in your Apple account that you have employed to buy files on your iPod. 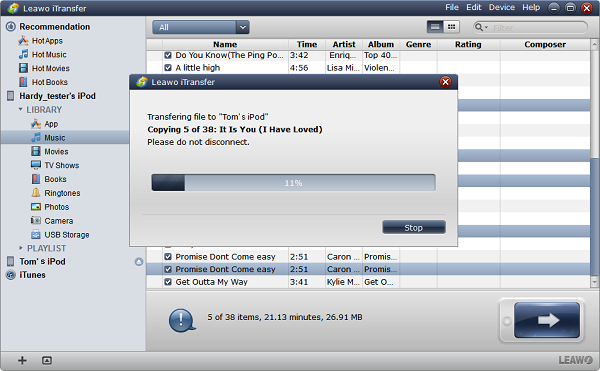 Afterwards, click on “File > Devices > Transfer Purchases from iPod”. When you finish the above steps, you will be able to view the iPod files on iTunes. This method helps you to backup all your purchased files from iPod to Mac. If you want to transfer the non-purchased files from iPod to Mac, you can find some other ways to help you. In the following part, we will introduce a tool that can help. When talking about data safety, it is sensible to backup important data on your device. We know iPod Nano is easy for us to carry, but sometimes it is too small to pay attention to, so accident drop or push might break it. Thus, the data would get lost. At this time, a data backup program will help a lot. 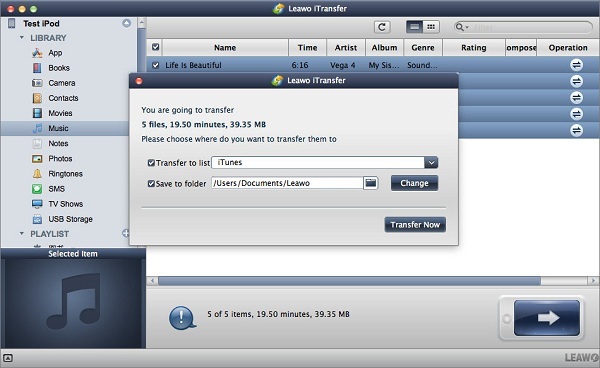 Leawo iTransfer for Mac allows you to transfer photos, music, e-books, contacts, etc. between iOS devices and computer as well as iTunes. It supports data backup from iPod to Mac and iTunes in a simple way. With this powerful program, you can transfer iPod data to Mac with ease. The way to use it is simple as below. Before all the steps, make sure you have installed the latest iTunes on your Mac. ☉ Support the latest iOS devices like iPhone X, iPhone XS, etc. Step1. 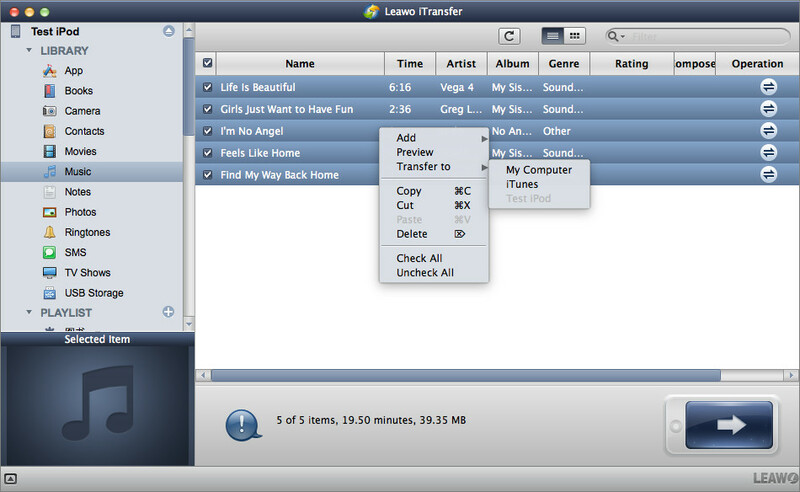 Install and run Leawo iTransfer, and connect iPod to computer. Click the name of iPod, and choose Music at the left sidebar. Then the music in your iPod will display at the right part. Step2. Choose the songs you want to copy to Mac, you can either choose a single song or choose a batch of songs. Afterwards, give a right click of the songs and tap “Transfer to > My Computer”. Of course, you can also click the transfer button at the right bottom. Step3. Choose the “Save to Folder”, click “Change” and choose a target folder on your Mac computer to save the backup files. Then click “Transfer Now” to start the process. When the process is over, you can find all transferred files in the target folder, and you will be able to view and edit your iPod files on your Mac. Besides music, you can also transfer videos, pictures and other data from iPod Touch and iPod Nano. Many iPod users choose to update their devices when a new iPod is released. Of course everyone loves new features and new functions. But how to deal with the songs remain in the old devices? So users will have to transfer music from old iPod to new iPod if they want to enjoy music in the new iPod. If you buy a newest version of iPod Touch, how do you transfer the data from your old iPod Nano? No worries, you can still realize it with the help of Leawo iTransfer. Please note that the below guidance is operated by iTransfer for Windows, but there is a very similar operation with iTransfer for Mac, so for users with iTransfer for Mac, can refer this guidance too. Step1. Run Leawo iTransfer on your computer. Then connect your iPods to computer with the USB cables. The software will automatically detect your devices and show the libraries of each iPod at the left sidebar. Step2. 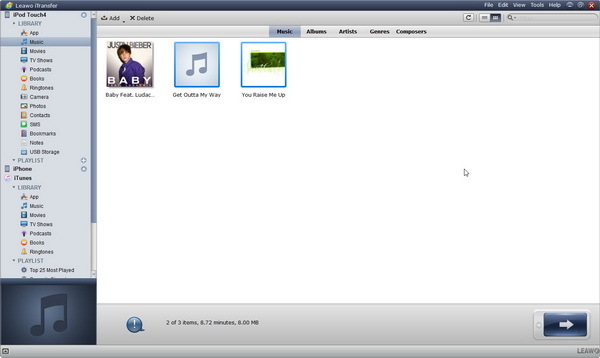 Click “Music” of the old iPod, and then the songs will be shown in the right part of the software. 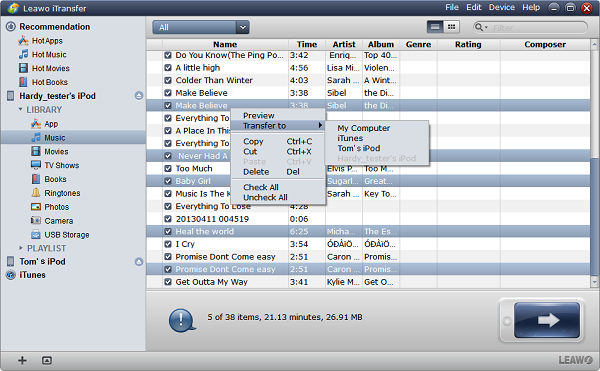 Click the transfer button at the right bottom to transfer all the selected music files. Or you can also hold the “Ctrl” key and click to choose songs, and then right click the chosen songs to “Transfer to > My New iPod”. Step3. After clicking the transfer button, the dialog of transfer settings comes out. 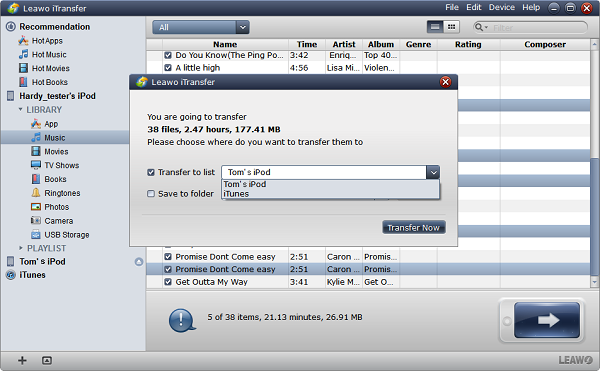 Check the “Transfer to List: My New iPod” and then click “Transfer Now” to start the music transfer process. Step4. When the transfer begins, a dialog of transfer process will show up. The progress bar in the dialog will show you the percentage of the transfer. You will get all the songs in your new iPod when the transfer finishes.